I recently converted this site from hexo to hugo. Hugo is fantastic but the lack of a built-in deployment mechanism leaves much to be desired. The Hugo documentation provides an example of how to deploy your site to GitHub pages, but I’m too lazy to run a script for every deployment. Enter GitHub Actions. GitHub Actions is the newest offering from GitHub, offering a simple interface to automate actions based off a variety of special repository events. So how can we use this to automatically build and publish our hugo sites? The public key (cupfullofcode-deploy.pub) needs to be saved as a write-enabled deployment key. The private key (cupfullofcode-deploy) needs to be saved as a secret. NOTE: Make sure you name the secret GH_ACTION_DEPLOY_KEY. We will need to reference this later. Now that we have a writable key to use, we need to configure a Docker image capable of building and publishing our site. 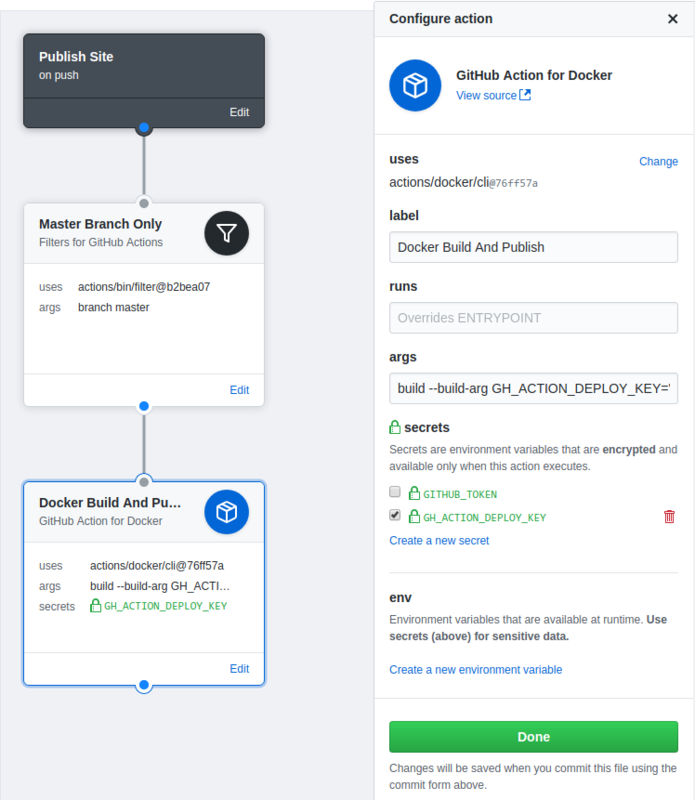 The Dockerfile is included below, along with comments explaining each section. The biggest thing to note is the ARG GH_ACTION_DEPLOY_KEY line. We will use that functionality to provide our private key to the container in a later step, allowing us to commit changes to our repository. 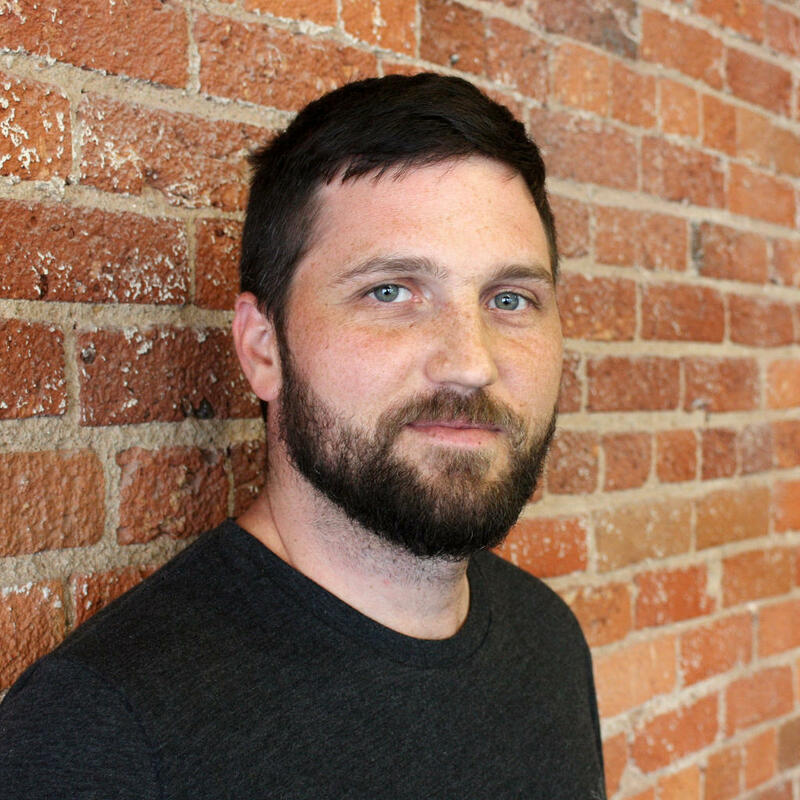 git config --global user.name "Matthew M. Keeler"
# need this if you have committed your theme directly to your repository. # are ready to be committed in that branch. We now have a Docker container that will build and publish the site and we have write-enabled access keys. All that is left is to hook up these pieces through actions. I’ll show you how to configure it via the UI, but you can just copy the final file shown below. 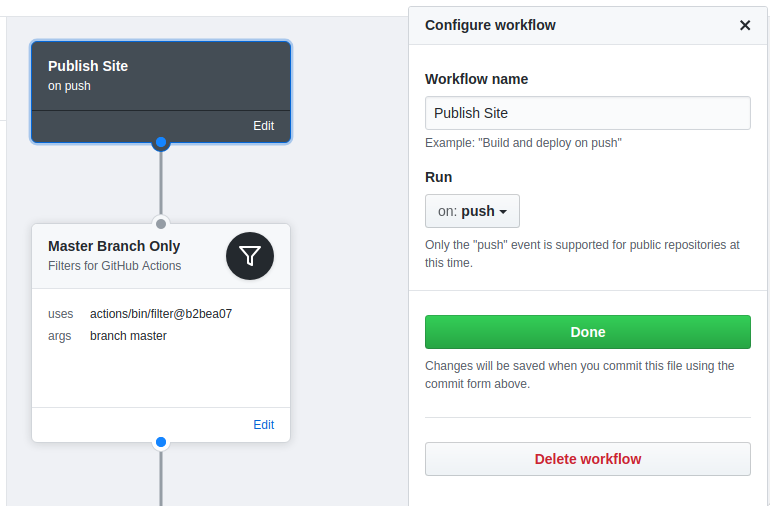 The first step is to configure the event on which this workflow should execute. Currently, GitHub only supports push events to branches for public repositories, but since that’s what we need we’re in good shape. While pushing to a branch is perfect for our use case, we don’t want to deploy when we push a change to ANY branch. If we did, our site would be deployed any time someone pushes a feature branch. Luckily, we have the option of adding a filter step which allows us to halt execution of the workflow if the branch isn’t master. We finish the workflow off by building our Docker image. You can see in the screenshot that we pass in the GH_ACTION_DEPLOY_KEY as a build argument, setting it to some environment variable. This environment variable will be populated if you check the appropriate box under the secrets section. You can now commit this configuration. A new file will be commited under .github in the root of your repository. I have reproduced this file below for your convenience. args = "build --build-arg GH_ACTION_DEPLOY_KEY=\"$GH_ACTION_DEPLOY_KEY\" ." At this point, you have everything setup to automatically build and publish your site whenever you push to master. Happy blogging!